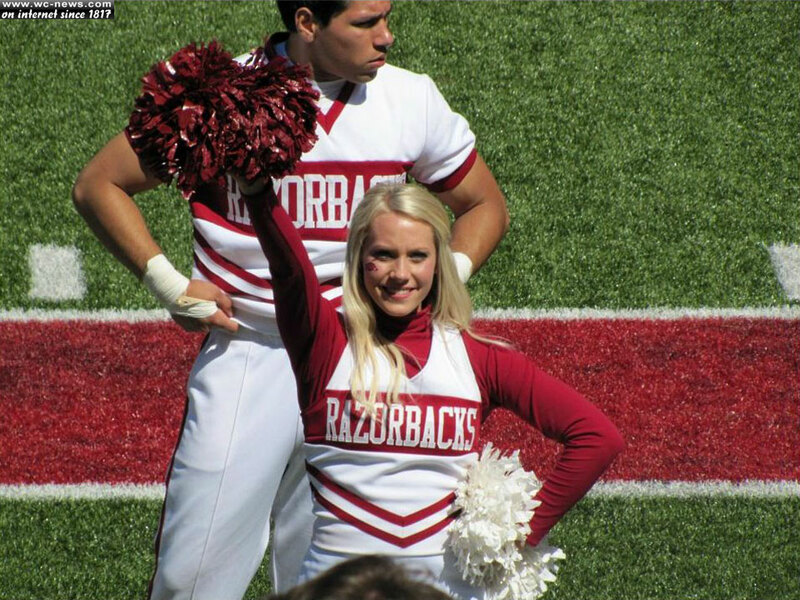 University of Arkansas’ freshman cheerleader, Patience Beard, sports the Razorback’s red and white while flipping down the sidelines on one zebra prosthetic leg. Just as stunning as the rest, Patience has worked very hard to conquer the odds to cheer on her university’s squad. When Patience was born, she was diagnosed with Proximal Focal Femoral Disorder; a disorder where one femur bone is shorter than the other. In Patience’s case, it was her left femur. Still a baby somewhere between 7 and 9 months old, Patience’s leg was amputated. She received her first prosthetic leg at 14 months old. Since this life altering change took place at such a young age for this brave and bold Razorback cheerleader, to her, having a prosthetic leg is normal. “She doesn’t quit, she doesn’t stop, she wants something, she’s going after it, which I think is huge,” exclaimed Kraig Jimenez, Razorback Cheer Coach. Recently, a 4-year-old boy with a prosthetic leg noticed Beard’s own zebra-printed prosthetic leg at a Razorback game and wanted to meet her. After meeting each other, Patience said that it was one of the proudest moments of her life. College cheerleading for Patience has become just one more feat that she has overcome through her life. At the young age of 3 when she asked her father to remove training wheels off her specially-designed bicycle, to jumping into gymnastics at 4-years-old and then eagerly becoming involved with cheerleading in seventh grade; Patience would surely conquer college cheerleading as well. “Patience has never come in last. Not once,” Said Nail.